Been racking my brains on what I would like to do with my Gotek and eventual HxC drives and thought it would be a good idea to create a thread dedicated to sharing/showing off your mods/attempts/ideas etc. I have personally decided not to go down the case modding route (but still very much interested in seeing them if you have). So I have been thinking of maybe mounting the display/switches of drive through grill and sitting on top of Amiga rather then creating holes to house them. Alternatively just creating a faceplate for the floppy housing and having the display/switches on outside of that. Last edited by ADz; 01 September 2014 at 03:39. Not my personnal mods, but here is some HxC examples. Many more examples can be found on the web. As you can see there are a lot of way to use it, with or without case modification. Here is the main idea video example from 2010. No case modification needed . One of my A500 with Gotek emulator. The housing wasn't the best, because of that i decided to make a hole for the display. Previously there was a switch for the memory expansion in that place. The emulator itself is attached to the upper part of the housing. And another A500 with RPi Drive, next to the SD card for the floppy emulation sits a CF card connected to a "DIY IDE solution". The third one from the right is great! I have gotek drives on two of my A500s, I don't like the idea of cutting original case so I installed it instead of original floppy drives. To be able to close the case I had to drill additional holes in the gotek's case, about 1cm to the front of the drive so it could be installed a bit (or about 1cm to be more precise) more to the back. This is the result. I can connect USB stick through floppy disk hole. There are two downsides to this, first is/was pushing buttons to switch images, second is reading which image is selected. I solved first problem by adding attiny microcontroller and InfraRed sensor to it so I can switch images with remote (cheap universal mini remote from ebay, about $1), sensor is sensitive enough to pick up indirect IR signals. Second is still up to debate. 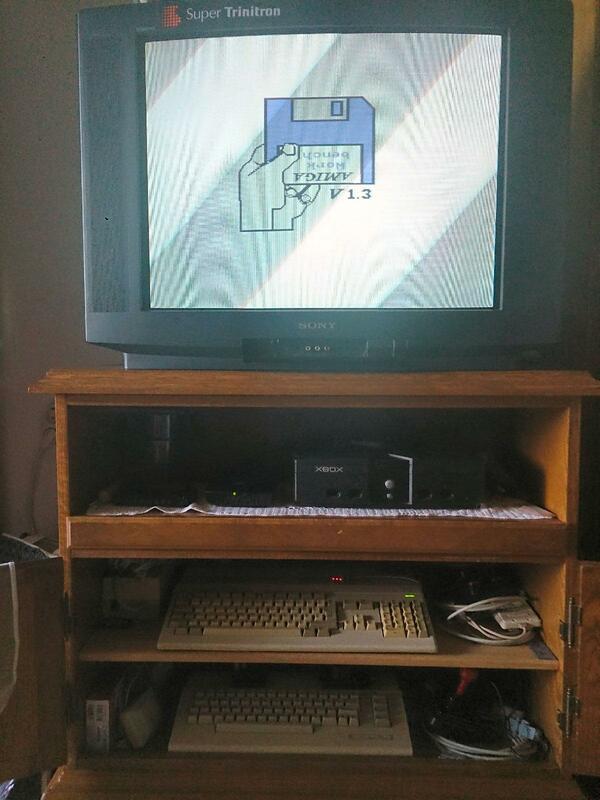 In other A500 I used extension cables to put LCD display outside the case, on top of Amiga. Good enough so far. This one is still unmodified as it's not really important to me if I'm close enough to tilt my head and see the numbers . The other one is different story, it's prepped for from the couch gaming so it's useful to see which number is mounted from few meters away . Beautiful, and professionally done . Didn't want to cut up the original case so I chopped up the gotek shell, removing the hump and reusing the shell pieces (as spacers - only where the normal floppy would bolt to case as the gotek is thinner) and making a new bracket you can get the drive to sit as close as i believe is possible to the floppy drive opening. Lowering the display a bit makes it very easy to see as well. As a bonus the floppy drive eject button hole, is the exact width for a 7 pin connector (with the drive spaced correctly it fits perfectly under the gotek) so with a little bit of wiring, I can now flash the gotek without having to open the case. Last edited by solarice; 03 September 2014 at 16:39. Still unsure on what I'm doing with mine yet. Will probably have a go at doing an internal job tomorrow. I have been de-yellowing case/keys today. That looks really good bud. You've done some nice work. Do you do commissions? I should report you for linking to such disgraceful abuse pictures. I think we need a new thread called Amiga Hardware Crimes. People can post pictures of mods/hacks gone wrong and confess to destroying amiga hardware.